Oftentimes, it can feel like you’re dropping your nonprofit’s Facebook updates into a black hole. You don’t know if your posts will get likes and shares, or if your fans will even see them at all. The fact is that brands constantly struggle with declining reach. Thanks to an ever-changing Facebook algorithm, and the massive amount of content already flooding the news feed, it can be challenging to increase your nonprofit’s Facebook stats. Paying for posts is an option, but for nonprofits that are financially strapped, there are still tricks to adopt and test for your organic strategy. Here are four ways you can maximize the reach and engagement of your Facebook posts. Instead of posting during the most popular times, try posting your updates during off-peak hours, when there’s less competition to get into your supporters’ news feeds. The idea is that when few others are posting at the same time, your content has a better chance of attracting eyeballs. The best time to post during the weekday is between 5 p.m. and 1 a.m. Eastern Time. Posts published over the weekend receive the most engagement, with Sunday posts getting 25 percent more likes, shares, and comments than those published in the middle of the week. The most popular times to post are Thursdays and lunchtime hours (12-1 p.m. EST). Try posting around these times to beat the traffic to your supporters’ news feeds. 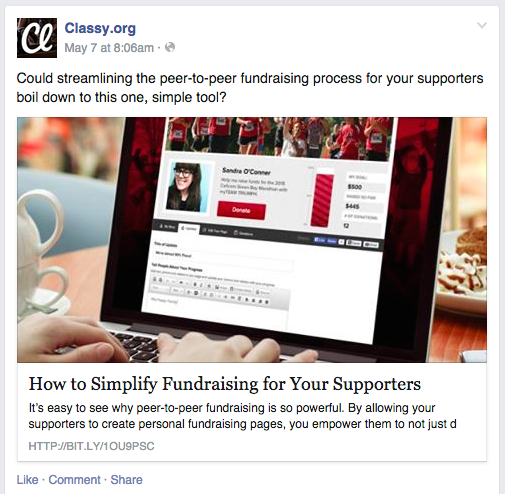 Chances are your nonprofit shares blog posts or other webpage links on Facebook. When you do, you need to be mindful of how you actually post your links. Facebook gives you two options on to how to post links, in link format or as a photo post. To create a link post, you paste the link into your status update, and Facebook pulls information from the link’s meta information, including the page’s title, description, and photos. After a second or two, Facebook displays this information in a link format post with a large image, headline, and some text from the page. You can then delete the URL out of your update window and write your own text. The other option is to create a photo post. You upload a photo separately, and then place a link into the status update or text caption above it. Apparently it matters which type of post you use. According to Facebook’s own studies, links displayed in the link format get twice as many clicks as those that are placed in photo captions. 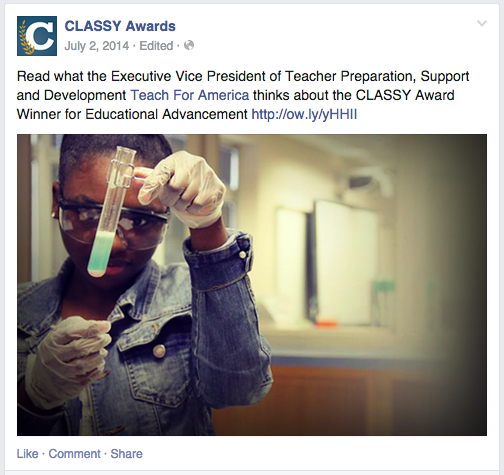 As a result, Facebook prioritizes link posts over photo posts. Make sure to direct readers to your nonprofit blog posts via link updates. With so much content flooding Facebook everyday, it seems that posting more frequently would increase your chances of visibility and engagement among your fans. But how does posting frequency really affect click-through rates? To find some answers, HubSpot rounded up some Facebook data from their 13,500+ customers to see how monthly posting frequency affected clicks per post. What they found was that the number of followers you have impacts the number of clicks you receive with each additional post. The more followers you have, the more clicks you can receive per update. To be exact, organizations with over 10,000 followers were the only Pages that experienced higher click-through rates (per post) by publishing more frequently. On the flip side, organizations with fewer than 10,000 followers received fewer clicks per post the more often they published to Facebook. The reason for this boils down to the fact that competition for users’ attention is at an all-time high. Your fans are being hit with tons of content everyday from both friends and brand pages alike. According to Dan Levy, Facebook’s director of small business, there are 30 million small businesses with active pages on the social network. As more and more pages produce more content, it has become more difficult to appear in supporters’ competitive news feeds. What does all this mean for your organic reach strategy? Rather than simply trying to post a lot, focus on posting quality content to your nonprofit Facebook page. Keep a regular schedule that works for your organization, but consistently deliver valuable content—whether in text, video, or photo type posts—that is hyper-relevant to your community. A classic engagement tactic used by brands is to ask a question. These posts include nothing else but a simple question, designed to garner responses and boost engagement. If you’re looking for more feedback and comments from your supporters, pose questions they can quickly answer. Of course, each industry and organization has its own strategies to reach their Facebook fans. Use these suggestions as a springboard for your nonprofit’s own tests and experiments, and learn what engages your audience. 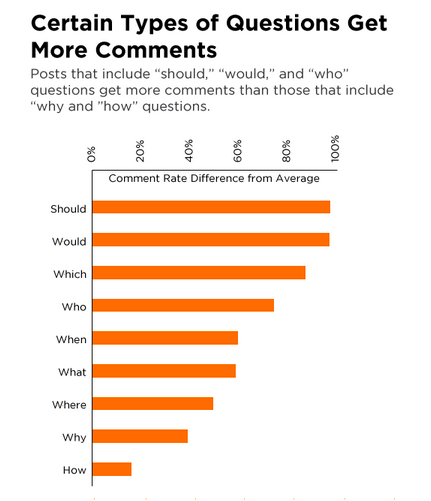 Which types of posts garner the most engagement? Do they perform well at night and over the weekend, or at some other time? What other tactics are tried and true for you? We’d love to hear what has worked for your nonprofit’s Facebook page. Please share in the comments below.